Do you find that you don't have enough time to prepare healthy and tasty meals and snacks? Do you want to loose weight but don't want to eat plain tasteless food? Would you love to have more energy, be happier and feel healthier every single day? Do you want an abundant supply of delicious, quick and easy weight loss vegan recipes at your fingertips ? 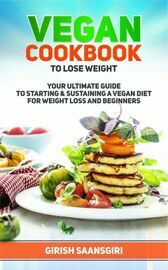 If any of the above questions made you say "Yes", then "Vegan Cookbook to Lose Weight " book is for you. You might have heard about the fact that the vegan recipe has helped a lot of people lose weight, but you might like to know how it works. Well, the answer to that is the vegan diet is chock full of fibres. The recipes “Vegan Recipes to Lose Weight” are ensured to help you get to be vegan forever. These recipes are healthy and delicious at the same time. You will discover how simple it really is to be vegan and lose weight quickly. The best part of all is that vegan diet is guaranteed to work for everyone who wants to lose weight. It is the kind of lifestyle change worth the effort, and you will not only be leaner, but also healthier & full of energy.